September marks There She Goes’ FOURTH year in business, and to help us celebrate, we are having a month full of FUN!! We started posting challenges on Monday, September 3rd, and we are keeping on through Friday, September 7th. We will be hosting one challenge per day. Each day will have a different birthday related theme, and will have a prize for the random winner chosen on Saturday, September 15th one $15 gift card per day!! Each day will have its own Inlinkz for you to link your creation to, and then on Friday, we will post an Inlinkz for ANYONE who has created a card for each challenge. The random winner chosen from all those that have finished all FIVE of the challenges, and added their name to the Inlinkz, will be entered to win our grand prize drawing-a $75 gift card to the There She Goes store!!!! Today’s challenge is brought to us by our blast from the past NEW trendsetter, Danielle!!! She has challenged us to make a card or project using a banner of any kind you wish, with a birthday theme of COURSE!! It can be a handmade banner, a patterned paper with a banner on it, an image of a banner…the skies the limit!! As soon as I saw the layout for the current Sweet Sunday Sketch Challenge, I knew it would fit perfectly with this banner challenge :-). Yeah!!! For my card, I've used the TSG set called "Wrapped in Joy" which is perfect for the birthday theme. I watercolored the image with Tombow Markers. The banners were created using the TSG die called "World's Best". Remember to come back and add your creation to the Inklinkz for TSGBC04!! Here are the rules: For the daily challenge prizes of $15, you can use stamps from any company you chose, but we would LOVE to see you using your There She Goes stamps!! However, to be eligible to win the Grand Prize of $75, all you entries much use There She Goes stamps only! You will have until 8pmEST Friday, September 14th to finish this challenge, and the winner will be announced on Saturday, September 15th at 12amEST!! That gives you over a week to get finished!! If you happen to finish them all, and we hope that you do, you can add your name to the Inlinkz being posted on Saturday, September 8th to be entered to win the GRAND PRIZE!!!! WOW - so gorgeous Angela! Love your coloring and the papers/colors are brilliant! 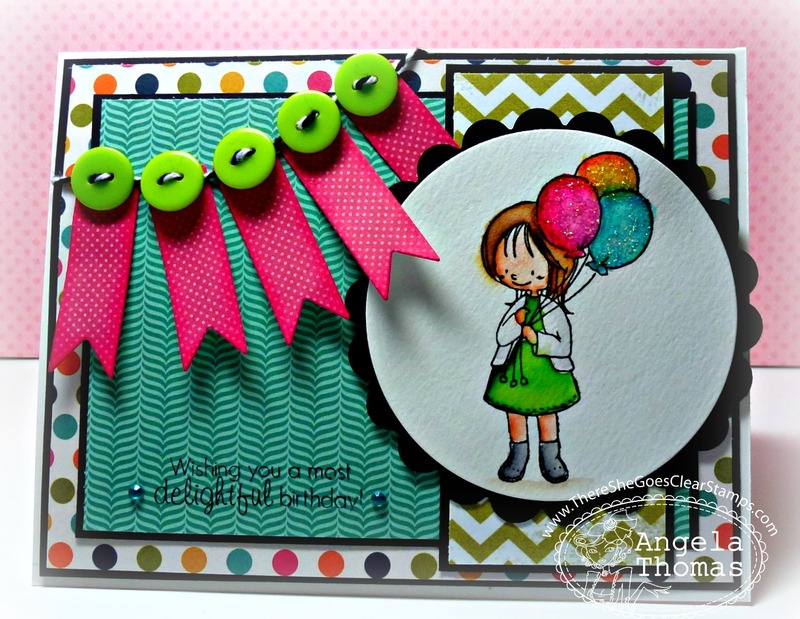 You used one of my favorite paper pads - love all the bright and happy colors - just perfect for the birthday theme as is that sweet image.